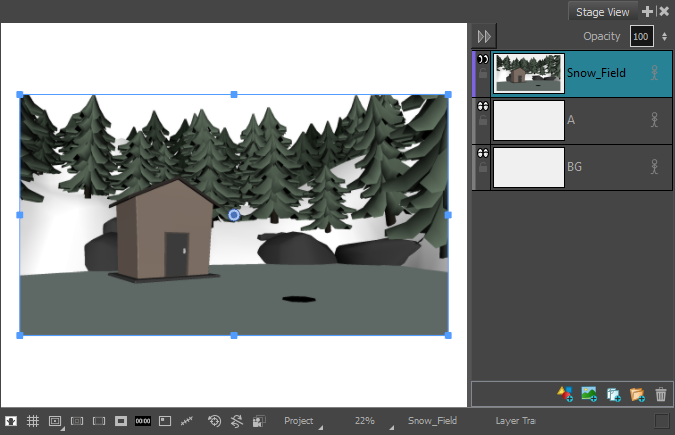 If you have rendered a 3D model in a 2D scene, and later decide that you need the model to be rendered from a different point of view, you do not need to re-import it into your scene. You can change the point of view of the rendered model directly. IMPORTANT If you have drawn anything on the layer in which the 3D model was rendered, updating the model's position will discard the artwork on that layer. In the Layer panel of the Stage or Camera view or in the Layers view, select the layer with the rendered 3D model. Right-click on the layer and select Update Model Position. In the top menu, select Layer > Update Model Position. The Render 3D Model dialog appears. The 3D model is in the same position as the one in which it was rendered, allowing you to tweak its current position. NOTE For information on all the parameters in this dialog, see Render 3D Model Dialog Box. If you want the model to fit inside the camera field, click on the Fit Model to View button just beneath the parameters to the right. Either click and drag on the vertical slider to the right or scroll the mouse wheel up or down to adjust the distance between the camera and the model. Hold Ctrl + Shift (Windows) or Shift + ⌘ (Mac OS X), then click and drag on the preview area to rotate the camera. Hold Spacebar, then click and drag on the preview area to pan the camera laterally. 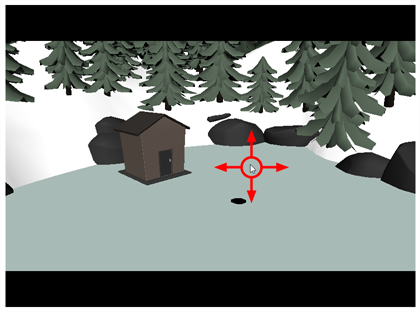 If you want to adjust the amount of perspective applied on the way the 3D model is rendered, adjust the Focal Length parameter. Increasing it will reduce the amount of perspective applied on the model, and decreasing it will increase the amount of perspective applied on the model. NOTE Increasing this setting will also decrease the perceived size of the 3D model, and decreasing it will increase its perceived size. You must then adjust the camera's distance from the model or the model's scaling to compensate. X: The horizontal position of the 3D model, from west to east. Y: The vertical position of the 3D model, from south to north. 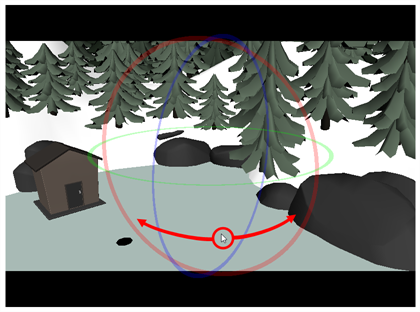 Z: The position of the 3D model relative to the camera, from near to far. X: The rotation angle of the model around the horizontal axis. Y: The rotation angle of the model around the vertical axis. Z: The rotation angle of the model around the z-axis. Lock Scaling Axis: When enabled, you can use the X scaling field to set the scaling of the 3D model on all axes, preserving its proportions. X: The horizontal scaling of the model. Y: The vertical scaling of the model. Z: The scaling of the model on the z-axis. 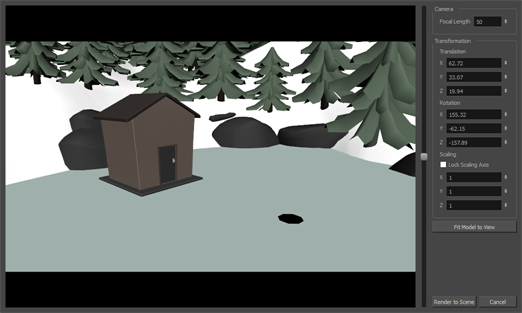 Click on Render to Scene. The selected layer is updated with the 3D model as rendered from its new point of view.